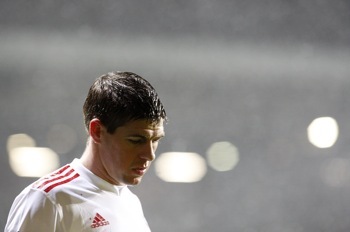 An unforeseen season horribilis for Liverpool in the making – nothing has gone right for Rafa Benitez, from the injury woes of Fernando Torres to the poor form of captain Steven Gerrard and key defender Jamie Carragher. Much of the blame must fall on Rafa’s shoulders – he was partly responsible for the departure of the vital Xabi Alonso, and quite how he’s managed to end up with such a thin forward roster (Torres apart) is beyond me; Peter Crouch and Robbie Keane, your Liverpool careers look better by the game. So the title has long been out of reach, and now it’s a mad scramble to qualify for next season’s Champions League – and of course, this season’s Champions League was also a huge disappointment. All those pundits who tipped Liverpool for the title back in August must feel pretty foolish now. Gold star: Pepe Reina. None of Liverpool’s outfield players has consistently played well. In detention: ‘Abject’ Andriy Voronin, obviously. But Steven Gerrard has been worryingly off colour too, while Jamie Carragher is having his worst season for a long time. Champions are rarely made overnight, and for all City’s owners’ talk about being happy with a bit of silverware and a top-six finish, the sacking of Mark Hughes (badly timed but the right decision – Garry Cook truly is the new Peter Kenyon) revealed that they genuinely believe the club can buy the title this season. However, realism must replace impatience – it will take time for City’s squad of expensively assembled stars to click. So far, so good, though – City have played very well in attack, but it’s their shiny new defence that has faltered – would you rather have Kolo Toure and Joleon Lescott or Richard Dunne and James Collins? Still, they have enough quality to crack the top four, though I suspect they’ll have to settle for fifth. Gold star: Craig Bellamy. Not one of the new band of mercenaries, but one of the players of the season so far. 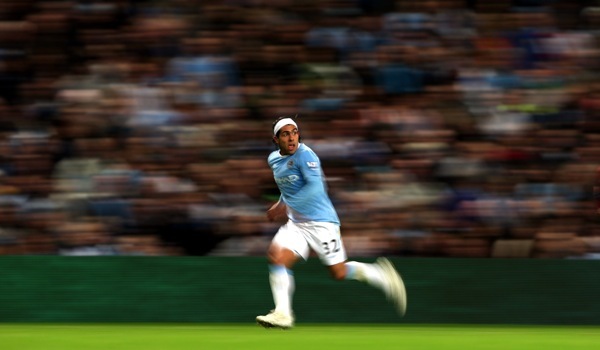 Carlos Tevez has also sizzled. In detention: City’s back four. Must try harder. I have rarely seen Man United play really well this season, but somehow they’re in second, in the hunt as usual and set fair for the part of the season when traditionally they embark on a ruthless winning run. But how did they do it? By winning ugly, something they have learned to do in the last couple of seasons – the fact that United’s rivals have all stumbled on more than one occasion has also helped. Not one of United’s players is having his best campaign (bar Darren Fletcher maybe), but of course there’s still more than enough quality in the squad to ensure that Fergie’s men win their fair share of games. But the loss to Leeds United in the FA Cup should be the kick up the arse that the club needs. Still can’t see them retaining their title though. Second behind Chelsea. Gold star: Darren Fletcher and Patrice Evra have stood out for me. United are strongest with Fletch in their midfield, whilst Evra is simply a marvellous player, despite the odd lapse. In detention: Plenty of candidates, including Nani, Anderson, Dimitar Berbatov, Michael Carrick and Ben Foster. But Berbatov gets my vote – the guy can play but has less heart than the Tin Man. The wheels are coming off at Pompey, with off-the-pitch problems leading to cast-iron relegation form. Indeed, relegation might be the least of their worries, as the club faces the very real threat of being the first Prem club to go into administration, with players yet to be paid for December. New gaffer Avram Grant will at least be forced to sell a couple of players in January, though looking at their less-than-convincing squad, I can’t see too many attractive propositions for prospective buyers. Gold star: A bare cupboard here. Younes Kaboul, for all his flaws, has given his all for the cause. In detention: Aaron Makoena has hardly impressed. Are Stoke the new Bolton? Could be. They’re a well-run team with a bit of cash to spare and a canny manager who knows exactly how to get the best out of his resources. No one could argue that they play pretty football, but for mid-table teams, effectiveness is the order of the day. After the Potters’ splendid overachievements last season, it’s easy to take this season’s respectable form for granted. That said, they could do with a good run, having struggled in December, and their current 10th place is slightly deceptive, as they are only six points above the relegation zone. Some of Tony Pulis’s decisions have appeared questionable, and you wonder how popular he now is in the dressing room, especially after the James Beattie spat. Gold star: Matthew Etherington has settled in very nicely. Ryan Shawcross’s stock has also risen. Good that Tony Pulis has seen the light and started to trust Tuncay, at last. In detention: Ricardo Fuller, criticised earlier this season by his manager for carrying too much weight, has failed to spark. The fourth and final bunch of reports will be posted tomorrow. D+ for Pompey? Their bottom of the table and surely will go down. How about an F? They’ll get an F if they go down! For now, I think the players get a little credit for doing OK in a very difficult situation. They have played better than their results, too. Poor old Pompey. I think D+ is a fair shout considering everyone else had 7 points before Pompey won any. Plus we’ve done a good job of just about staying in the hunt despite being bottom for the majority of the season. I just think this month, and all of the off-field troubles, will be too much for us. So Man City, who are only 2 points ahead of Liverpool, get nearly a B+ while Liverpool get a D+? This, despite the fact that City have spent about £250m in 2 seasons on players, while Liverpool have actually made a profit. Bellamy 14m Santa Cruz 18m Adebayor 25m Robinho 32.5m Jo 18m Tevez 30m 8.8m Wright-Phillips 18m Toure 18m Lescott 24m Barry 12m De Jong 17m, Caicedo 5m not to mention Bridge, Ben Haim, Kompany, Zabaleta, Given at a combined total of over 30m. Yes Liverpool deserve their D+, it maybe should even be lower but City also deserve the same. Yeah- if the current positions stay the same it will be Manchester City’s best for 18 years and Liverpools joint worst for 16 years. Sounds ok to me. City have spent a lot of money of course but a big improvement on last season suggests that they have spent it reasonably well so far while the less said about Rafa’s transfer dealings the better. Liverpool could currently have a strike force of Torres, Keane, Crouch and Owen- instead with Torres out they have N’Gog and well, thats about it isn’t it? kenapa ya liverpool terjadi terpuruk di bandingkan Man City ..
massa iya hanya gara-gara fernando torres and steven gerrard cedera ..
kan msh ada dirk kuyt,maxi rodrigez,dll.